If you’re bored of the same old yellow flamed candles then these are an interesting alternative. 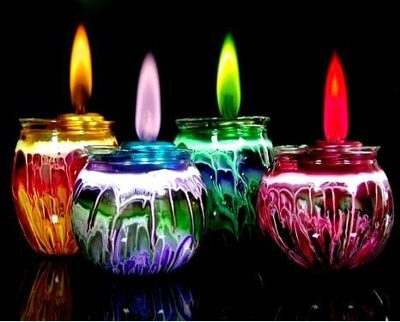 The candles burn with various different colored flames including Romantic blue, Passion red, Fired yellow, Youthful green and Mysterious purple. The candles are available from More Than Light, found via Ursi’s Blog via Netkulture. Well, in order to achieve those colors, you have to burn certain chemicals, such as sulfur or copper. My question is, do you think there would be some sort of vapor or oderous problem there? They do look wicked cool though! (Pun, I’m sorry heh). Nice colored Flames! What is in the fumes going into the environment? What health risk from “normal” inhalation could possible be involved? Hi Di, I must admit I’ve no idea what the chemicals are, I’d hope they wouldn’t be harmful but you’d be best contacting the suppliers or manufacturers I think.